The waters of San Juan County and Cypress Island are designated a Marine Biological Preserve (MBP), with FHL as the managing agency (House Bill 68, R.C.W.28.77.230, 1969 Revision R.C.W.28B.20.320). Since 1923, the FHL director has annually approved scientific collection of marine plants and animals within the MBP. However, a number of marine species and sites in the region (and all sites outside of the region) require additional permits, licenses, or permission for collection/transfer of organisms. Before collecting in the National Parks, State Parks, or National Wildlife Refuge, researchers must obtain permits. To collect in the Biological Preserves or WDFW Fisheries Preserves (including the FHL campus and shoreline, False Bay, Argyle Lagoon, Yellow and Low Islands and areas of Shaw Island), researchers should request permission from the FHL director. Many other tidelands in the region (or access to them) are owned by individuals or organizations and researchers should contact the owners/caretakers/agencies before collecting on those lands. Contact Megan Dethier for more information about permission and access to particular locations. 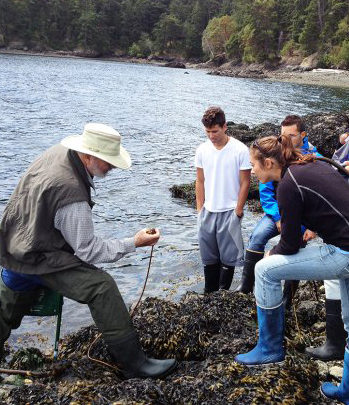 Collecting marine plants or animals for food is allowed only in certain areas and within certain limits and requires a state fishing license (sold at Friday Harbor stores). Food collection is not permitted in the WDFW Fisheries Preserves (e.g. you must be 500 yards or 3/4 of the distance towards Brown Island from the FHL shoreline). Imports of marine organisms from out of state and some transfers from Puget Sound and coastal bays within state require a state permit in advance. These imports usually require quarantine for research (for more information contact the Shellfish Division of Washington State Fish and Wildlife). Keep track of ALL organisms you collect, and submit FHL Organism Collection Forms (below) to report your collections. When collecting, please minimize damage to organisms and populations, obey laws on collecting, use animals efficiently, keep them alive and healthy whenever possible and return survivors to the site of collection. Return rocks that have been turned over to their original position. Refill holes dug in sand or mud. Do not leave holes or mounds. Avoid damage from trampling as much as possible. Any collection within FHL Preserves requires permission (see list below). Always minimize the number of animals collected. In returning animals, avoid transfers of plants and animals with low natural dispersal. Some field research is destroyed by collecting. Check for study sites before collecting. Consult with Megan Dethier about sites often used for collecting and sites of ecological research and let her know if you have sensitive field sites that need protecting. More information regarding Permits and Collecting can be found here. Your next researcher application will not be approved unless you’ve reported your collected organisms. You will need to fill out a separate collection form for each species you collect (except planktonic species and life history stages), regardless of whether they were collected on the same date and/or location. Most imports of marine species into Washington State for research are illegal without a permit from the Washington State Department of Fish and Wildlife. Permits, if granted, will require strict quarantine, with no contact with the FHL sea water system. The list below includes the species that require special permission to collect. Researchers intending to SCUBA dive or snorkel must contact Pema Kitaeff at the time of their application. Researchers intending to work with fishes or other vertebrates are required to submit a project protocol to the UW Animal Care. Contact Pema Kitaeff at the time of your application. Please note that Animal Care Protocols require at least two months for processing. General procedures for working with fish or other vertebrates are outlined in our Animal Care Standard Operating Procedures.